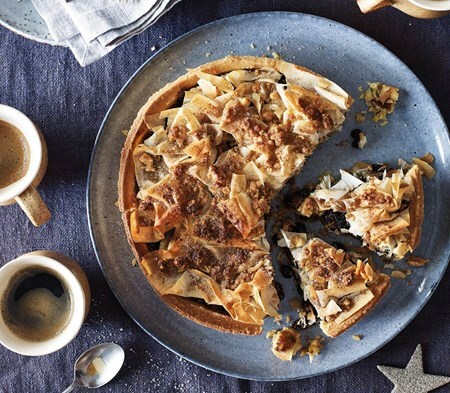 Our own mincemeat, made with spiced rum, and pieces of Bramley apple on a sweet shortcrust base topped with crisp filo pastry and cinnamon crumble. We make our own mincemeat with a good splash of spiced rum. That goes into a sweet shortcrust base with pieces of Bramley apple. It’s topped with filo pastry scrunchies, a scattering of shortbread crumble, and a dusting of cinnamon demerara sugar. Please Note: The details above are correct as of 24 December 2018 but as we are constantly improving our recipes it is essential to check the label on the packaging. Shortcrust Pastry (32%) (contains: Butter [Milk] (contains: Salt), Plain Bread Flour (contains Bread Wheat, Calcium Carbonate, Mastermix, Ascorbic Acid), Margarine (contains: Vegetable Oil (Palm Oil, Rapeseed Oil), Water, Salt, Emulsifier: Mono- and Diglycerides of Fatty Acids, Natural Colourings: Annatto, Curcumin, Natural Flavouring), Caster Sugar, Free Range Pasteurised Egg Yolk) Brown Sugar, Raisins (10%) (contain: Sunflower Oil), Sultanas (10%) (contain: Sunflower Seed Oil), Currants (10%) (contain: Sunflower Oil), Filo Pastry (6%) (contains: Wheat Flour (contains: Calcium Carbonate, Niacin, Iron, and Thiamine), Water, Sunflower Oil, Salt, Processing Aid: Potassium Metabisulphate), Spiced Rum (6%) (contains: White Rum, Jamaican Rum, Natural Vanilla Extract, Natural Mulled Wine Flavouring, Colour (Plain Caramel)), White Bread (contains: Wheat Flour (with added Calcium, Iron, Niacin, Thiamin), Water, Yeast, Soya Flour, Salt, Preservative: Calcium Propionate, Emulsifiers: Mono- and Diglycerides of Fatty Acids (Glyceryl Monostearate, Glyceryl Distearate), Mono- and Diacetyltartaric Acid Esters of Mono- and Diglycerides of Fatty Acids, Flour Treatment Agent: Ascorbic Acid), Mixed Peel (2%) (contain: Orange Peel, Glucose- Fructose Syrup, Lemon Peel, Sucrose, Preservative: Potassium Sorbate, Acidity Regulator: Citric Acid, Preservative: Sulphur Dioxide), Tinned Bramley Apples (2%), Self Raising Flour (2%) (contains: Wheat Flour (contains Calcium, Iron, Niacin, Thiamin), Raising Agents: Acid Calcium Phosphate, Sodium Bicarbonate), Demerara Sugar (2%) (contains: Sugar, Cane Molasses), Sweet Snow (contains: Dextrose, Cornflour, Vegetable Oil (Palm)), Orange Zest, Cinnamon, Mixed Spice (contains: Ground Cinnamon, Ground Coriander, Ground Ginger, Ground Allspice, Nutmeg, Ground Cloves), Golden Syrup (contains: Sucrose, Invert Sugar), Rapeseed Oil, Water, Lemon Zest. 1.Remove from packaging while frozen. 2.To serve warm (which is best), heat from frozen on an oven-proof serving dish for 25 mins at 180°C (160°C fan) or gas mark 4.If defrosted, heat at the same temperature but for 15-20 mins. 3. If serving cold, defrost at room temperature for 1½-2 hours. 4. In the unlikely event of leftovers, keep in the fridge and eat within 48 hours.